You don`t need to spend a fortune on office flowers to create a look that is both stylish and elegant. This architectural style corporate flower arrangement is perfect for a boardroom, office reception or modern retail space. 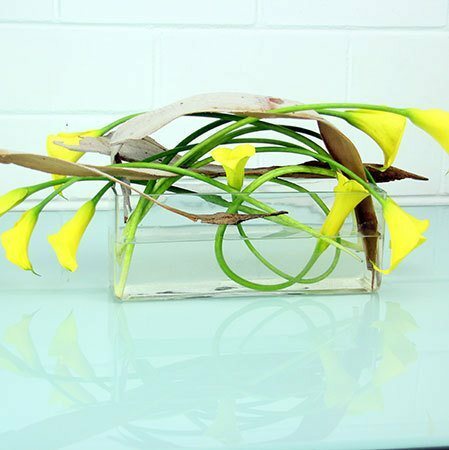 Designed in a rectangular glass vase using tropical calla lilies, these corporate flowers can be customised in a variety of colours dependent on seasonal availability. Where calla lilies are not in season, alternatives such as orchids may be used instead. For a customised corporate flower arrangement based on this look, simply call our florists on 1800 66 66 46 or email sales@flowersforeveryone.com.au to discuss your specific needs and budget. *Please note: Flowers for Everyone provide weekly delivery of office flowers throughout the Sydney metro.